An early 90’s Toyota corolla arrives at the front gate of our guesthouse in Gilgit. It’s six in the morning. A man opens the passenger door and slaps the front seat with a rag. The car is here to take us to Islamabad, 560km to the south. We are both in pensive but determined mood.Two days ago while doing preliminary investigations on getting an Indian visa in Pakistan we discover disturbing news. The consulate is advising that due to the current security situation the average time for a visa to be processed is 35 days! It is also made very clear that payment of visa fees does not ensure a visa will be granted. Once establishing what prefixes to use, we try to call the embassy, but each time we speak English the phone hangs up. We scan the website looking for alternative numbers. Eventually a promising lead presents itself. We speak with Dr Acquino Vimal +92 51 282 8370. He confirms that the application will on average take 3-4 weeks! This is a disaster. 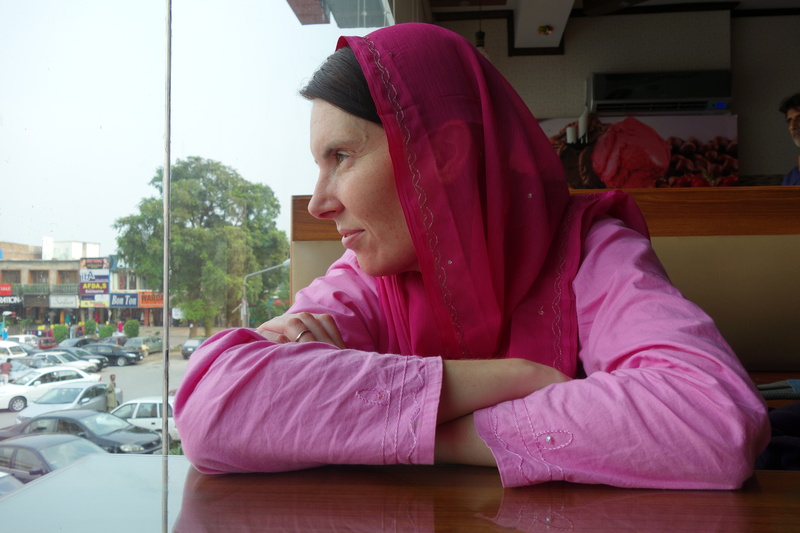 Our plan had been to continue our tour of the north before heading down to Islamabad and onto Lahore and India. I should point out that the 560km normally takes 24 bone jarring hours in a bus each way. The thought of having to make a trip down and then back up again just to lodge a visa is sickening! We consider other options. Rather than take the risk of applying in Pakistan and travelling over 48 unnecessary hours, we explore the possibility of returning our passports back to Australia by international courier and lodge them in Sydney. A visit to the DHL office kills the idea. They are not able to courier passports as Pakistan customs won’t allow it. Another blow. A few weeks ago it seemed like all our visa issues were behind us and now they are back with vengeance. Could coming to Pakistan have painted us into a bureaucratic corner? To further complicate matters all visa applications must be typed into a PDF and printed. Hand written applications will be rejected. We spend the next 5 hours trying to fill in an application that has over 60 questions, including fathers place of birth, your last visa number which we don’t have and mothers profession! Each time we go back to retrieve the PDF the code is invalid. Our laptop also keeps switching off for no apparent reason?! We find a thread that reports applicants should not go to the actual embassy. The best way to lodge is to go to the TCS office in Islamabad. The visatronox section www.visatronix.com/index.aspx will handle applications. Our laptop flickers off. There seems no other way but to travel down to Islamabad, lodge the application and return to the mountains up north while our visa is considered and pondered over at the embassy. 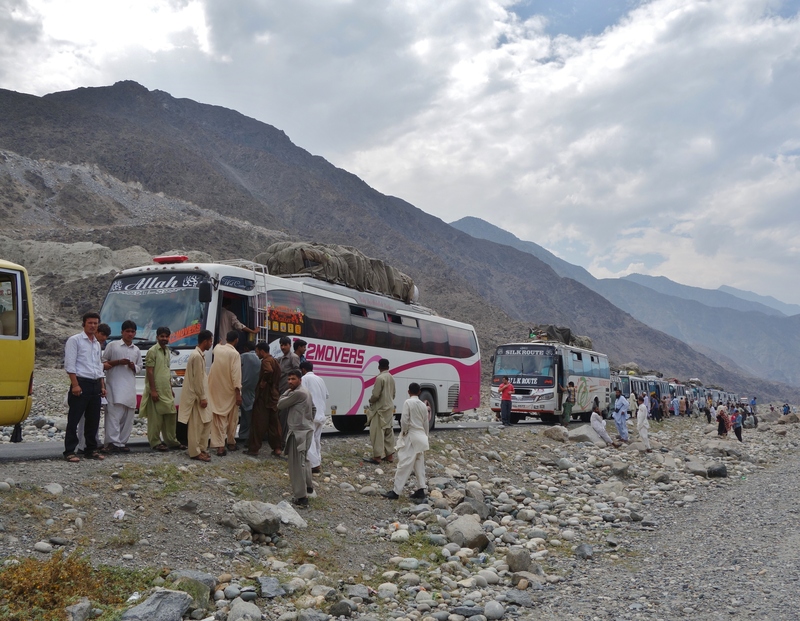 The issue with the Karakoram Highway is complex. In the last couple of years several attacks on busses have meant that travel in convoys is required. The convoys have slowed what was an already long journey. The other options are to fly… which is out of the question, or to take a car. The car can travel faster and avoid the dangerous sections before nightfall. As such they are not required to travel by convoy so the total time to reach Islamabad is shaved down to a mere 16 hours! The only issue being that they are expensive. 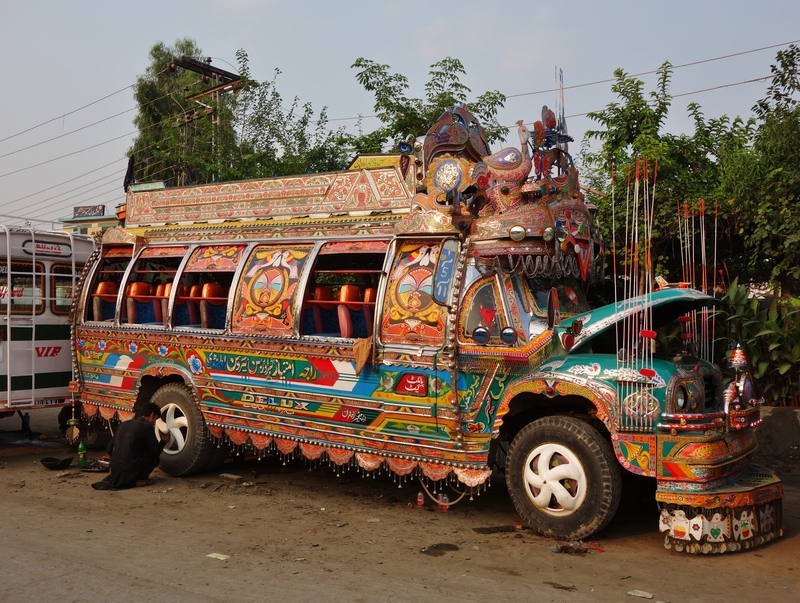 The bus is about 1500-2000 PKR, the car will cost 6000 PKR each or about $120.00 USD in total. The thought of back to back journeys on a bus is too much. We weaken and take the car; at least for one leg. 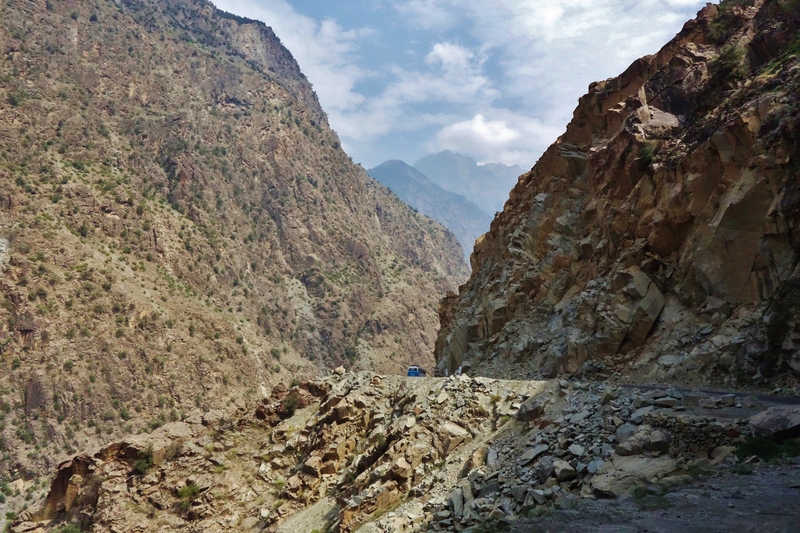 The first two hours are comfortable until you reach the Raikot Bridge. This is also where you turn off the KKH for Fairy Meadows, but I digress. This is as far as the Chinese road builders have reached. Smooth communist bitumen gives way to neglected and broken south Asian asphalt. Our driver speaks English well and even manages a few expletives about the condition of the international highway. The corolla sweeps around the multitude of bends. Swerving from side to side, we are rattled by the many bumps. The journey becomes both mentally and physically sickening. Despite the poor state of the road we clear the so called dangerous area (Chillas to Besham) by 2pm, but there is still a long way to go. 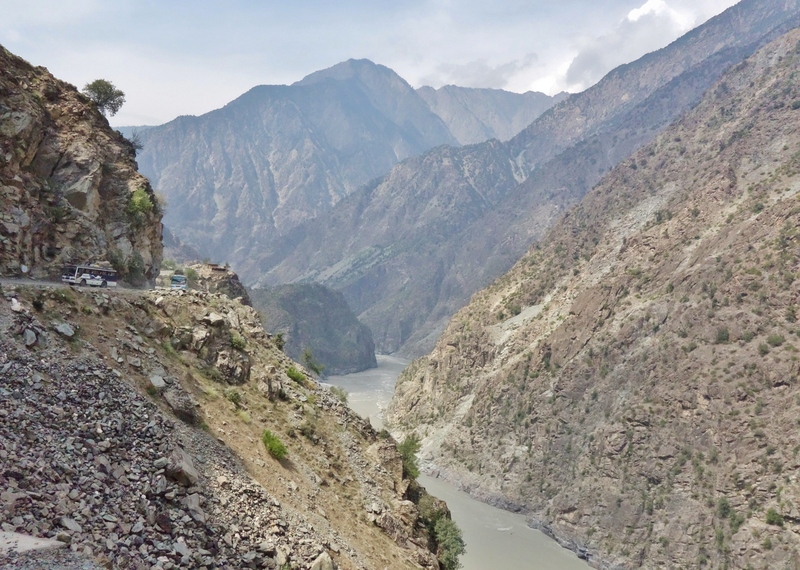 The KKH departs the Indus river and heads south through Abbottabad; notorious now as the city where Osama Bin Laden was executed. In reality it is just another small city, but oddly it has an abundance of Eucalyptus trees. Upon seeing them I think of home. It’s a warm sunset as we descend to lower altitudes. The humidity has crept up, all that is missing are the cicadas. By the time we reach Islamabad it’s just after 10pm. Our driver despite his tiredness takes us to the area where the visatronox office is located. An odd address I and T centre, block 11, G-6/1. 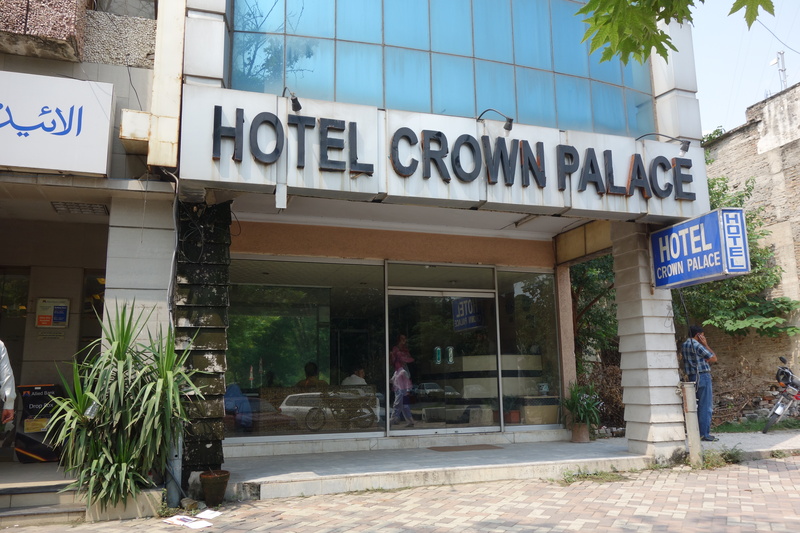 We come across the Crown Palace Inn and not much else. Its horrendous value at 3500 PKR but weariness and a need for sleep help to cover up the mouldy walls and stained carpets. The next morning we (after a small struggle) locate the visatronox office. It is pouring with rain and any shelter provided is occupied with motorbikes forcing you to walk in the downpour. We are directed around the corner to a translation agency who can type the applications and print them. The cost is 750 PKR each. A kind and elderly man types the applications as I dictate. The progress is slow and the mistakes are many. I ask if it is at all possible for me to type as I can’t keep explaining the difference between a G and a J. This is not possible! We continue slowly. Upon finishing there is an error in the spelling of Emma Jane. She is now Emma Jan. We take no risks and ask for it to be corrected. I look in horror as he opens a new PDF. The old one can’t be edited??!! All 60 questions are again filled in with a new round of mistakes and corrections made. We take our place at the visatronox office and wait to be called. Our papers are examined but there is a big error. Emma’s current nationality is British on the form but we are lodging with an Australian Passport. In the section for former nationality he has Australian. We go back and yes it must be typed all over again including more explanations regarding the difference between G and J…smiling inside I promise! He is far too nice to be angry at. Finally the applications are lodged. It feels like they should be rolled into a bottle and thrown into the sea. Please find someone good. We are weary and mentally drained. We are also starving and decide to go in search of authentic Italian cuisine…the Pizza Hut. Don’t judge us. After three taxi rides each one a few kilometres in distance and 200 PKR, we finally find the Holy Grail. The sign, the font, the familiarity, it’s all too much. Air conditioned bliss! We take a moment to lust over the choices and the glossy photos of food to come. Over by the salad bar locals are spooning food into their bowls and half way up their arms. We can only assume that return visits are not permitted. In an attempt to sample some traditional food I order the Afghan Spicy Chicken Tikka Pizza. I’m feeling adventurous. Emma takes a tomato and chicken penne both of which are delicious. Not since leaving Cairo have we had the taste of home. It feels good to indulge. If you find yourself in Islamabad go to the Jinnah Supermarket. We make plans for the return journey. Feeling rested we decide to save some money and take the bus back to Gilgit. It’s like the point of no return. The pain has not started yet, but you know what lies ahead. 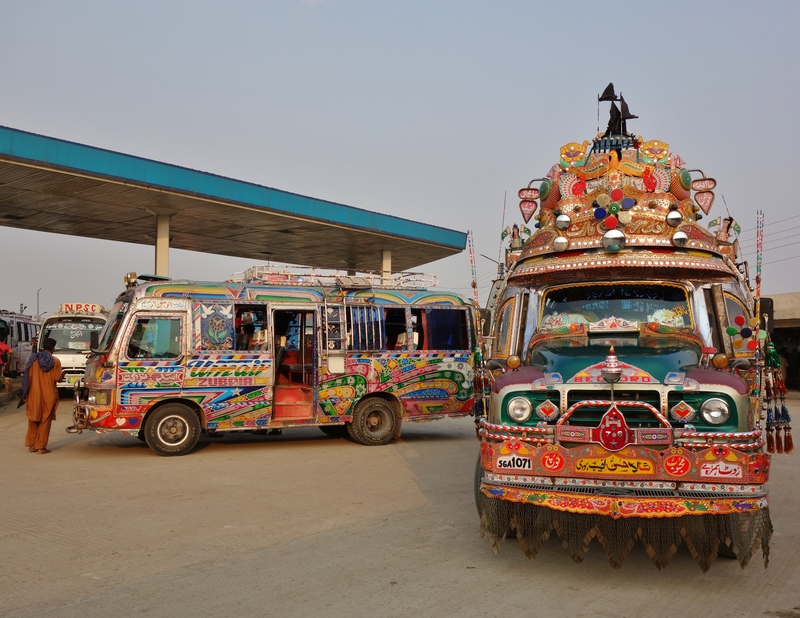 All busses to the North depart from Rawalpindi a city located 20km to the south…a great start! Nasir has booked us a couple of seats near the front, an absolute must if you want to retain your lunch and dinner. The bus station is thriving with relics from the past, painted in psychedelic patterns. Some of the creations would have no doubt pleased the Beatles on their magical mystery tour. Our bus, Silk Route Ltd is by comparison sedate but comes with the dubious promise of Air Conditioning. It costs us 2000 PKR each almost $20.00 USD. We fight our way out of Rawalpindi through choked streets and choked air. The sun is a blood red disc above the dirty buildings. I feel a sense of satisfaction that at this moment there is no more I can do. The passports have been lodged we are back on a bus and travelling. After all… is this not an adventure. My optimism and buoyancy start to wane after a few hours into the journey. The metal bar in the back of my seat has announced itself and my spine is not pleased. I shift so a new vertebrae can be acquainted. Outside cars and trucks flash past with musical horns and high beam lights. It reminds me of the night crossing from Kampala to Nairobi. Everything is the same, but the faces and clothes have changed. We reach Besham at 2am. It has taken us nine hours. A couple of guys sitting next to us translate that we will sit here for 3-4 hours until morning. The convoy is stopped. I am so tired I just curl up in a ball and wait as we make no progress, it’s heart breaking. I can hear a rooster somewhere. A shutter is opening and the sky is no longer black. My neck hurts and my mouth is dry. Then, like a pack of wild dogs the busses start howling musical tunes. I am convinced that Pakistan must have the world’s loudest horns and there have been some serious contenders. Silk Route Limited responds and roars into life. We are reversing back onto the KKH. The relief is overwhelming. One step at a time, I remind myself of where I am and what I am doing. Our driver is revitalised and demonstrates his skills on tight bends and sheer drops. Despite the need to travel in convoy he overtakes slower busses at any given opportunity. His definition of opportunity is questionable. I abandon western ideals of physics and necessity and embrace Inshallah or God willing. He comes up the inside of his next victim. Ahead I can see the road narrows and a rock is jutting out. This will be interesting, good luck with that I say to myself. It’s like I am watching a movie, perhaps from latent fear my mind has detached me from my current situation. He threads the bus and rock with precision, never once breaking, but I wonder if its good luck or good management at work. Perhaps both and we certainly need it. By the time we reach Gilgit its 5.30pm and we been travelling for just over 24 hours. We should be exhausted but the adrenaline from reaching the end is flowing strong. It’s been a crazy three days, but the pain is over, the job is done. It’s a busy morning in Skardu. The last of our provisions are being packed into blue barrels and loaded onto a jeep. Ropes and crampons are checked by our two guides Nasir and Habib. 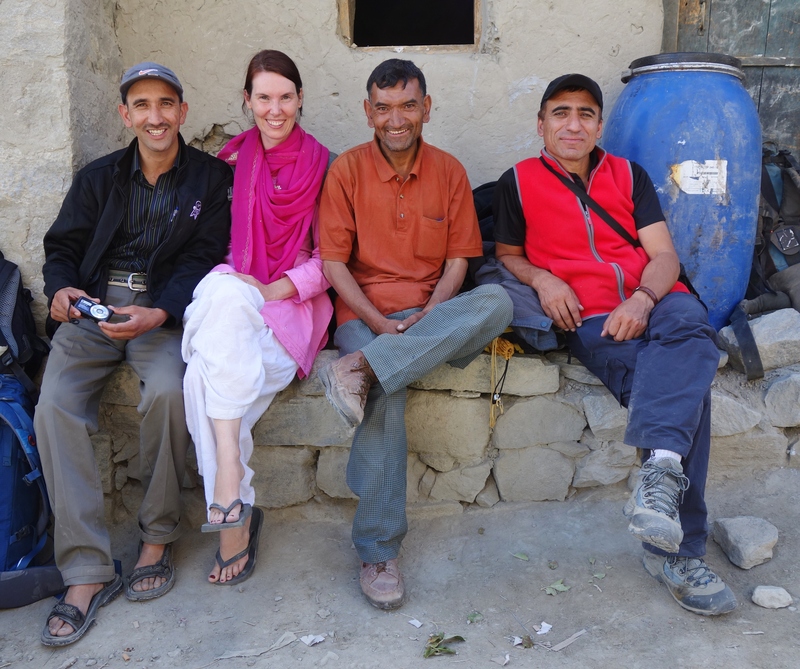 We met them both four years ago on our K2 Base camp trek and have remained good friends ever since. Also making a return is our head cook Amin, but he is more than just a cook. Amin is at first a quiet and unassuming man but take him up into the mountains and his stature grows. In his own words jokingly…I am a Karakoram Tiger. He used to be a high altitude porter and survived a blizzard above 8000 meters on K2 for four days. In other words, he is harder than Vinnie Jones in a Guy Ritchie film. But along with this toughness, is a very caring and highly entertaining soul. He has an uncanny ability to sense when you are struggling and a helping hand or uplifting joke is always perfectly timed. Nasir is the head guide and leader of the expedition. This morning he is in concentrative mood and ensuring that nothing has been forgotten. 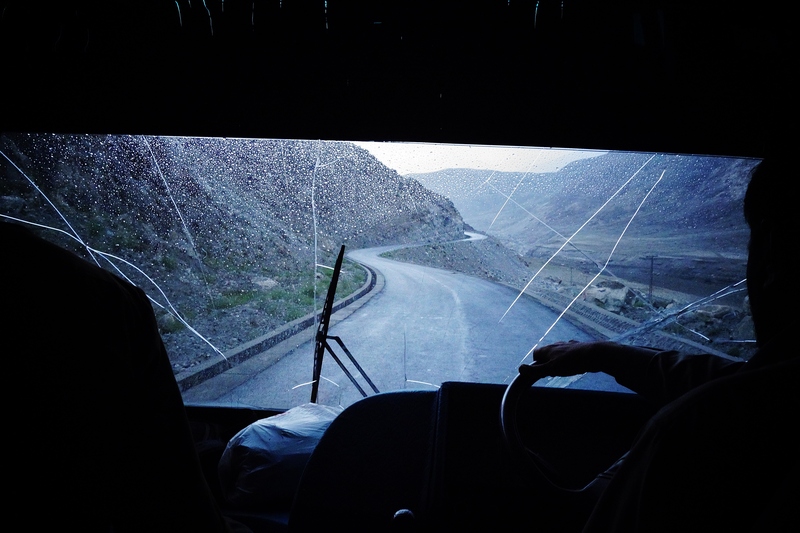 Once in Askole it’s a long and bumpy 8 hour drive back to Skardu. Everyone (save us) sits in the back tray of the jeep. I am placed in the front next to the driver. It is a cramped position and sitting slightly to one side after a few hours becomes painful. Habib explains during lunch that I must place my right leg over the gear stick and sit straight. The position becomes uncomfortable for a different reason and every time the driver needs to change gear, he reaches between….well, you know the rest. Safe to say my hip stops hurting which is the main thing. We arrive late afternoon in Askole. 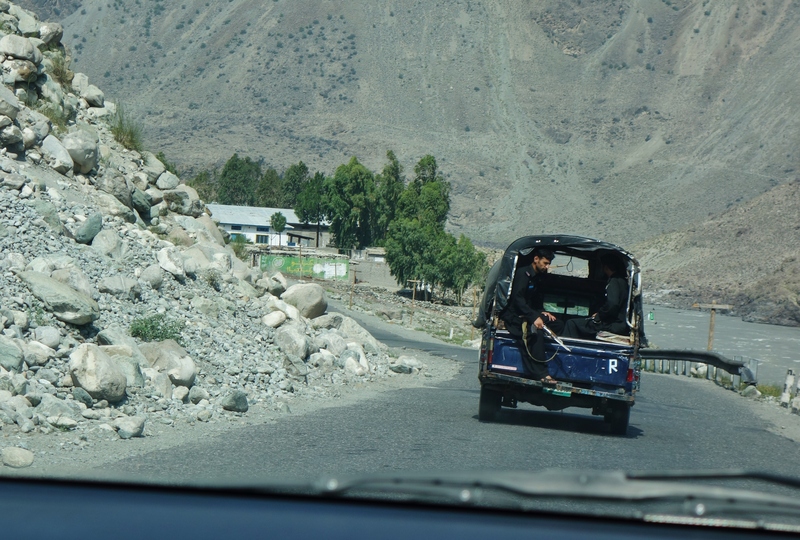 The drive alone from Skardu has been captivating but the real drama of the Karakoram Mountains lies ahead. 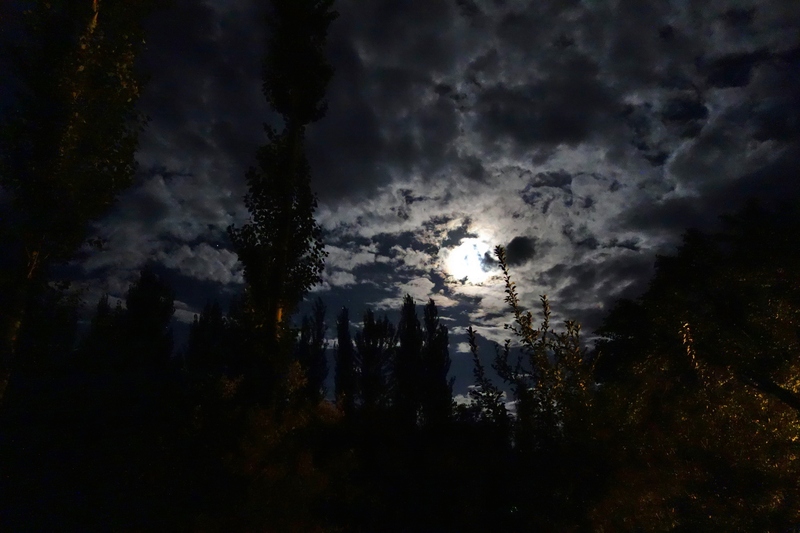 That night the clouds darken and it rains. Next to our camp are three British trekkers who have returned from K2 base camp and Snow Lake. They look a little deflated. The weather has been very unkind for the last 2 weeks and they were unable to cross the pass at Snow Lake and forced to return. Its ominous news. We too have been watching the weather for the last few days and now on the eve of the trek it shows no sign of improving. The easy pace, and kind terrain changes abruptly as we make a left turn and start to scramble up the terminal moraine of the Biafo glacier. Moraine being a pile of dirt and rocks that accumulates at the front and sides of a glacier. The bigger the glacier the larger the moraine and the Biafo is one of the largest glaciers in the world, outside the Polar Regions. As we climb higher the air thins and the heat rises to a midday peak. Picking our way over the rocks is not easy and there is little breeze and no shade. Emma by sheer bad luck has been struck down with a stomach bug on our first day and begins to suffer. We reach the top of the moraine but the jumble of rocks does not end. This is just the beginning as we must walk along the lateral or side moraine for the next two days. It can be a heart breaking scene if you are in bad condition or not feeling well and Emma right now is both. By early afternoon our water is running out and I too begin to suffer among the boulders. I curse myself not carrying another bottle. Eight hours after leaving Skardu we arrive at our camp. A small island of grass on the side of the cliffs. It is a welcome sight. I know our health and fitness will improve, as will the conditions. It’s been a hard first day but better days are ahead. By four in the afternoon the sun disappears behind the towering cliffs. On the far side of the glacier we are treated to an amazing light display on the stony towers. They bask in golden rays, the light showing off their rough texture. 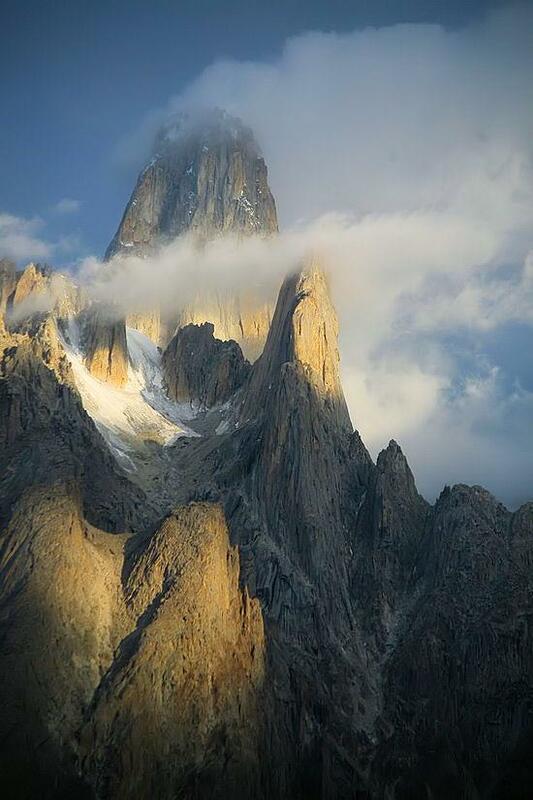 Of all the mountains in the world none can compare to the brutal formations that are the Karakoram. I notice a sign near our camp indicating this to be a place where snow leopards have been sighted. Our chances of seeing one are close to non-existent, but I scan the high valleys and peaks anyway. They must be one of the loneliest animals on earth but what a domain they live in.The next day and Emma’s condition has not improved. An hour out of camp and she is plagued with stomach cramps and unplanned visits behind boulders. Despite the discomfort and inconvenience she soldiers on. Nasir and Habib are attentive and take turns to lead, ensuring that we never stray too far off course. Without them we would become lost in a maze of rocks within minutes. Ahead of them is Baqir the fourth member of the lead team. Baqir is with us as his knowledge of both the Biafo and Hispar glaciers is unsurpassed. He too has been a high altitude porter and now scouts ahead. Last and certainly not least is Amin. He catches up as we take a break. Habib and Nasir always up for a joke ask him why he is following us. Amin quick as a fox feigns altitude sickness and wobbles on his legs. I have lost my guide he says in a croaky voice. Habib laughs. This Japanese climber is lost and wants to follow us, what should we do? Where are you going Amin san? Well you are going the wrong way, K2 is in the other direction. I am making new route to K2 he says with a twinkle in his eye. We all laugh, it is just the tonic when you are feeling a little tired. After 6 hours of rock hoping and scrambling we reach camp on the far side of the Biafo. It’s a lovely patch of green with a good stream fed by the melting glacier. Amin prepares a special meal for Emma to ensure her stomach is not tested too badly. On the morning of day three we scramble over some more moraine and finally reach the white ice of the Biafo. It is flecked with small stones providing traction to walk upon. We shift from 1st to 5th gear and make good progress. After 2 days of tedium on the moraine we now surge ahead on the white runway. It feels good to stride out. Our progress is so good that we make our next camp after only 4 hours where we come across another group. They had arrived yesterday but are staying here for an extra day to acclimatise. The team are comprised of Pakistanis from the Punjab region. They welcome us into camp. We are now at an altitude of 3800 meters. 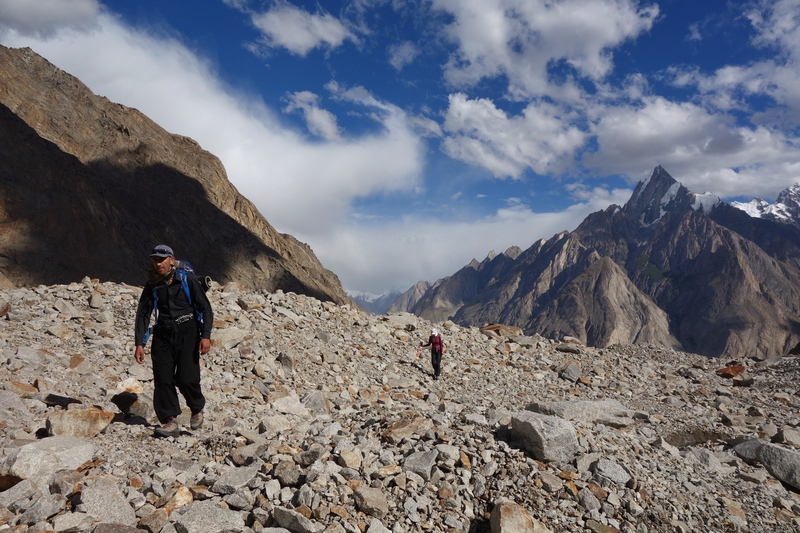 Nasir and Habib are careful not to take us too high too soon and stick to the general rule of not exceeding 500-600 meters in elevation per day. I should mention at this point we are also supported by 10 porters. These guys are the engine room of the trek. Without them it would not be possible. Each morning they pack up and pass us with ease carrying 25kgs. 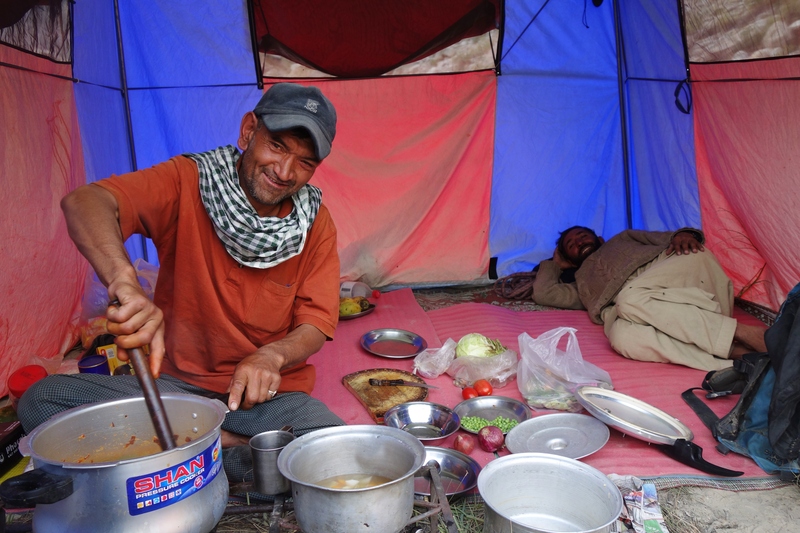 When they get to camp there is no immediate rest, they set up our tents and the kitchen tent. Carry water from the streams and bring it back so it can be boiled. Nasir and Amin go ahead in the last hour to ensure it all goes smoothly. Habib normally remains with us to make sure we find our way into camp. When we arrive, Amin is already slicing potatoes and has chai and more jokes waiting. We sit on mats in the Kitchen tent and play cards each afternoon with Nasir and Habib. Amin stirs both a physical and metaphoric pot; watches over Nasir’s shoulder and occasionally snickers at his decisions. Dinner each night comprises of soup, a main course of rice pasta and vegetable curry followed by a dessert of jelly, custard and even some mangoes. I am amazed by the meals produced in such a cramped place. It is early evening on day five and we have arrived at our camp before crossing the pass. The last five days have been clear with light cloud but now as the sun goes down dark clouds gather and it starts to sleet. If the bad weather holds we will not be able to cross the pass. Amin, Nasir, Baqir and Habib all take turns in predicting the weather. Nasir is confident it will pass during the night as the wind is strong. We have a couple of days up our sleeve to see if the weather breaks. Later that night the clouds break up and the stars come out. To my left the moon is rising and the Biafo is bathed in silver. We are woken at 4am by the sound of a gas burner and cups being washed. Nasir comes to our tent. The weather is good, we are going over the pass. We pack up our gear and put extra layers on for the cold morning outside. We take a simple breakfast of chai and biscuits. It’s far too early for a stodgy meal. We cross the side moraine of the Biafo for the last time and step onto the crunchy ice. The moon is still high in the early morning sky. The land around us is a monochrome of blue. An hour later and the tops of the mountains are turning yellow. The ice beneath us is replaced with fresh snow and Baqir stops the group. The snow hides the crevasses we have so far been able to see, but from now on they will be invisible; so we must all be roped together for safety. Baqir takes the lead and sets a steady pace. He keeps us on course and heading towards the base of the pass. The Punjabis are about 500m off to our right. I look across. They appear like dust on a table cloth in this vast white expanse. We have reached the head of the Biafo Glacier better known as Snow Lake. Here the glacier is over 16km in width. 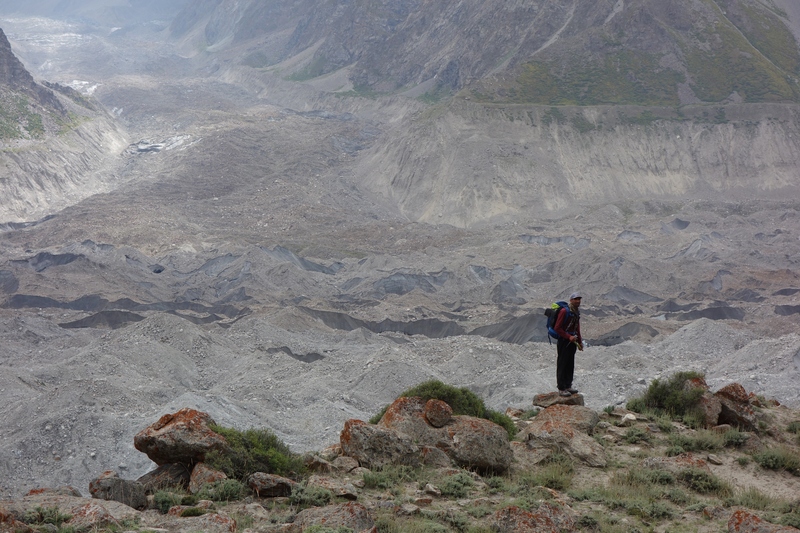 We have travelled just over 70km in 6 days since we first climbed up the terminal moraine. The wind on the glacier is cold but as we reach the bottom of the pass it abates and we take a break. Ahead I can see two huge crevasses with a wide bridge in between. We cross the bridge and start the climb. The gradient is at first gentle by mountain standards. 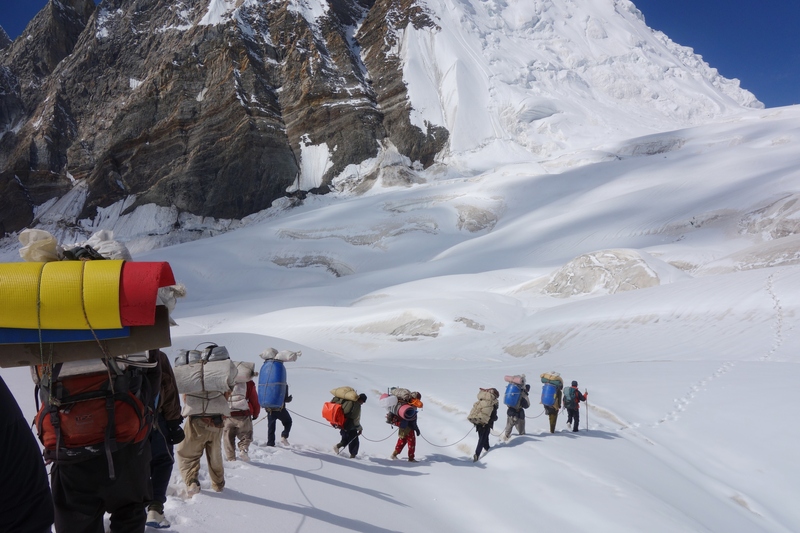 We approach a steep section but the snow is soft and Baqir and the porters create deep treads that are easy to follow. No crampons are needed. Following the porters on a rope is not easy as we are forced to keep up, but heading uphill is not too bad as they are handicapped with their loads while we carry by comparison very little. We take a long break around 9am, we are now about half way up the pass. The Punjabis are a long way behind and no longer in sight. There is no trace of wind and we start to peel away layers of clothing. Pushing on we make the top of the pass around midday. Behind us Snow Lake shimmers white under a noon sun. In front of us we catch our first sight of the Hispar valley and Glacier. The mountains on this side of the pass are immense but not as jagged as those along the Biafo. The porters celebrate with a Balti war cry before picking up their loads. Challow…Challow is called out, the Balti word for lets go. It is a word I am going to curse very soon. 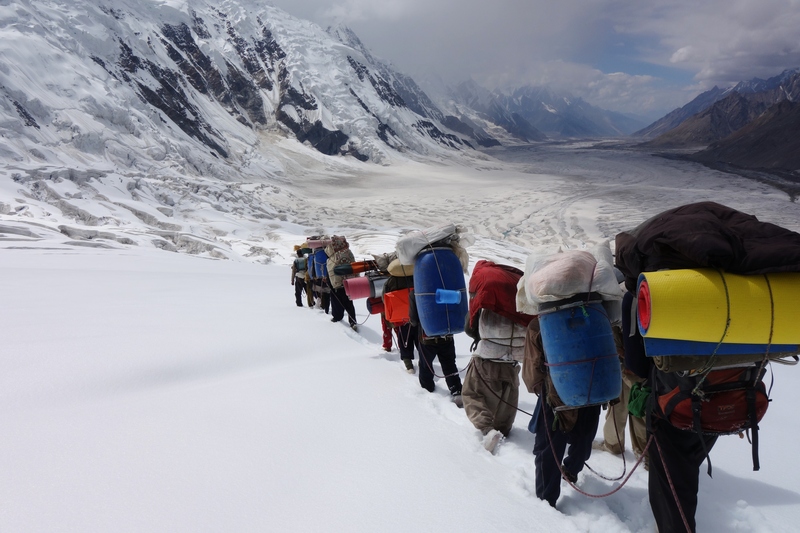 Up until now the porters have been held back by gravity and heavy loads. Now as we cross the pass the terrain is flat and their true power is unleashed; it soon becomes difficult to keep up on the rope. The deep snow is not making life any easier. There is not a trace of wind and the sun shines hot on the white snow baking us in all directions. I can see grey clouds ahead and start to crave their presence but the lack of wind keeps them away. Each rest is a relief we have now been going for 9 hours and I am getting very tired. Emma is having a good day but is now also feeling a little fatigued. Challow… Challow….not already. The snow is softening and Baqir is getting concerned. If we don’t get down soon it will be too soft and the crevasses are waiting for the weak and unfortunate. An hour later and we are now heading downhill but this has just increased the pace. We come across a section of ripples and a couple of porters drop down to their shoulders. We have hit crevasses. He is stuck and can’t get out. Nasir comes forward and with the aid of another porter and pulls him out. Baqir prods at the snow with a long stick. Despite his best attempts a couple of more porters sink down to their waists. We sit and wait while they get pulled out. It’s so hot I rub snow on my arms and the back of my neck. 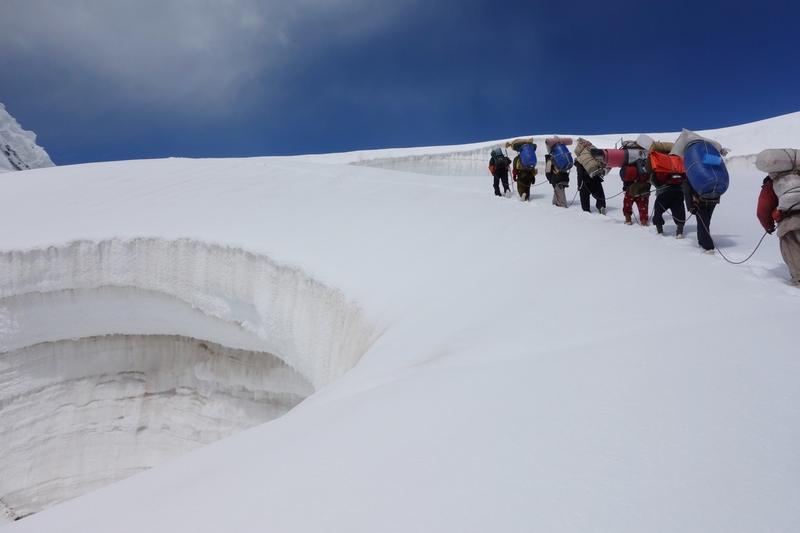 We round a bend and walk across a snow bridge avoiding a deep crevasse just to our right. The bridge is on a slope and a little slippery. As I cross the bridge the rope pulls tight and pulls me over. I fall over the slope and dangle above the crevasse. The weight of the group ensures I only fall a few feet but it is still an unsettling experience. It’s now my turn to be pulled out. 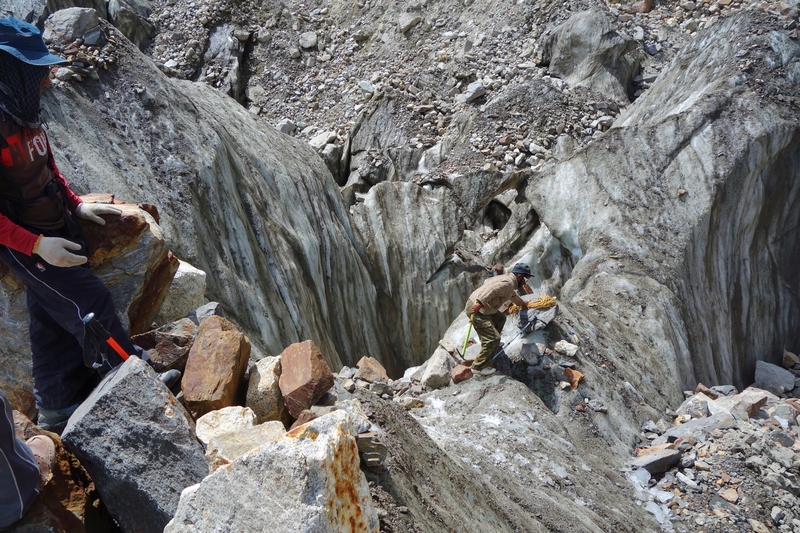 We cross the crevasses, it’s now just an easy 30 minutes downhill to the base of the pass. The porters increase the pace again. The group senses the end. We are now skiing behind the porters and concentrating on not falling over in the soft snow. That night we make camp on the glacier. It’s taken just over 10 hours but we have crossed the pass, there is no going back now. 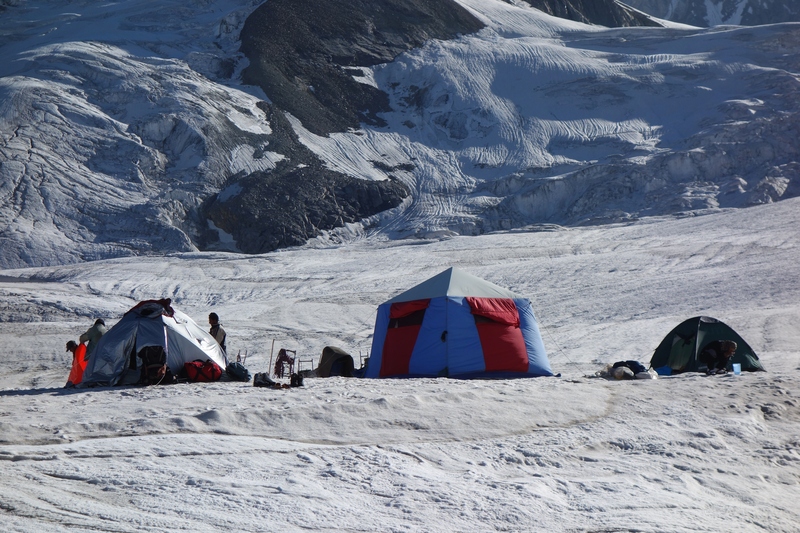 Camping on the glacier is a romantic notion but it comes with some compromises. The sun goes down and the wind builds in strength. The cold ice reaches up from the ground and chills your bones. Even with foam matts, it’s hard to escape. That night I crawl outside my tent. I have been fighting a losing battle with my bladder for the last hour and finally surrender. I unzip my tent and stand on the glacier. The moon is not out yet and the sky is littered with thousands of stars. The night is black and frigid; I shiver in the breeze. It is the coldest Milky Way I have ever seen. The next morning I wake feeling a little groggy. My legs are stiff. I feel like I have been in a fight and lost. Amin has prepared delicious porridge with apricots and raisons. My mood lifts. Habib tells us we have an easy day only about 4 hours and we will stop. It’s now day seven and we make our way off the white ice of the Hispar. Unlike the Biafo the Hispar has in past years been difficult to cross. The left side of the glacier is too dangerous and the right side has several smaller glaciers that flow into it. Each of these must be crossed. There is no more white ice, no highway left. 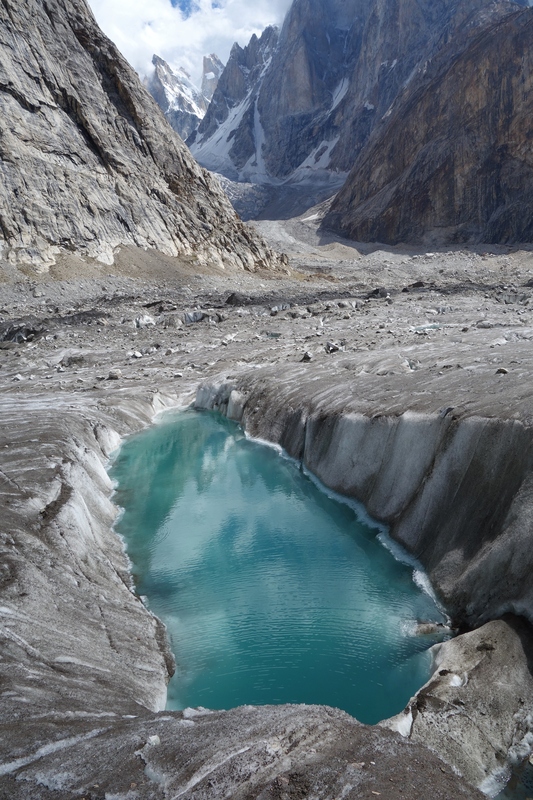 On the 8th day we come across the confluence of two glaciers. The morning has been difficult already crawling across a series of land slips. Now in front of us rocks and crevasses stretch for over 2km. It takes your breath away as well as some of your resolve. 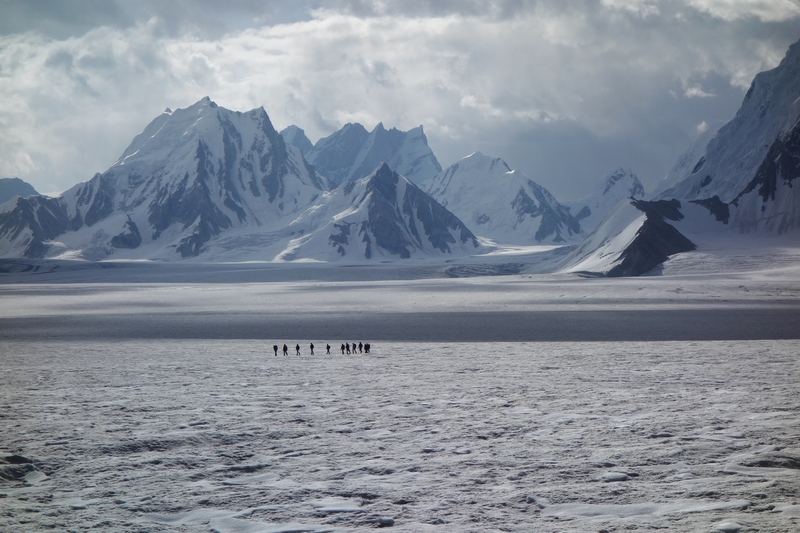 The Hispar glacier is the graveyard of rocks. From tiny pebbles to massive boulders, they all come here to die. Among the multitude, 16 people pick their way over the corpses. The glacier groans and creaks. It bleeds running water, the rocks are like stony scabs on its skin. Habib and Baqir go ahead to ensure we are not blocked and forced to backtrack. Nasir and Amin stay with us to provide moral and physical support. As we near the far side of the junction we reach a small section that requires us to fix a rope. Baqir has chopped some steps into the polished surface. On both sides of the slippery bridge a deep crevasse lays in wait. The security of the rope makes a huge difference. Without that it would be a perilous little descent. It’s now the morning of day ten and the village of Hispar is only four hours away. It hangs across the valley surrounded by golden fields of wheat. It is calling us, but before we can reach it we encounter one last adventure. 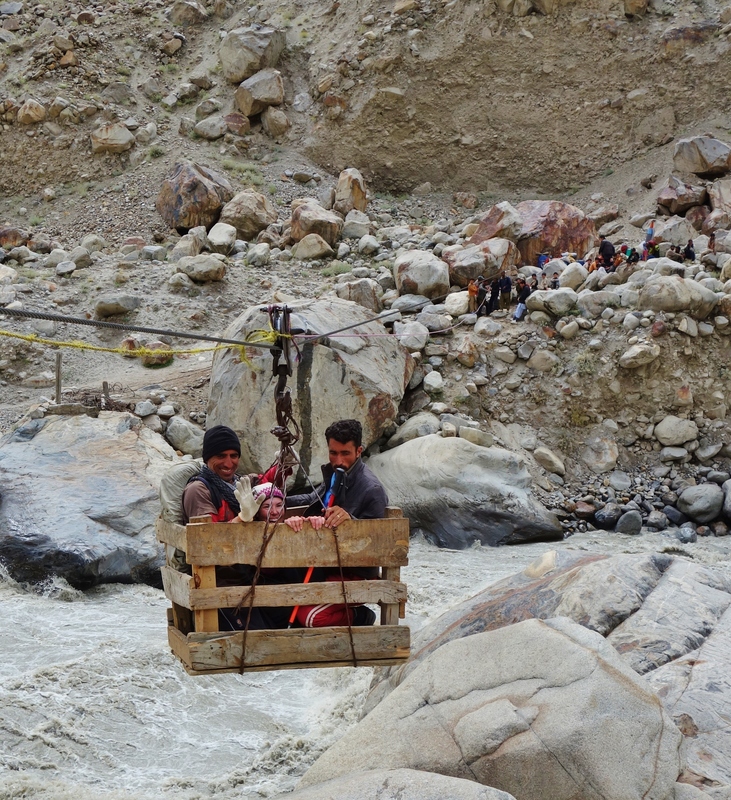 The bridge has been washed out by summer floods and we have to cross the river in a make shift basket suspended by a cable and pulled across by a rope. I have seen these put to use before but have never ridden in one. It’s a bumpy and exhilarating ride. Below us the power of the river roars. The waves reach up snapping at the basket. We all cross safely and hike up a steep hill into the village of Hispar. We have reached the road. I feel a sense of relief and sadness. This has been special trek made with special people. At this point in time I study the porter’s faces and thank them all. The thought of never seeing them again is difficult and painful to consider. 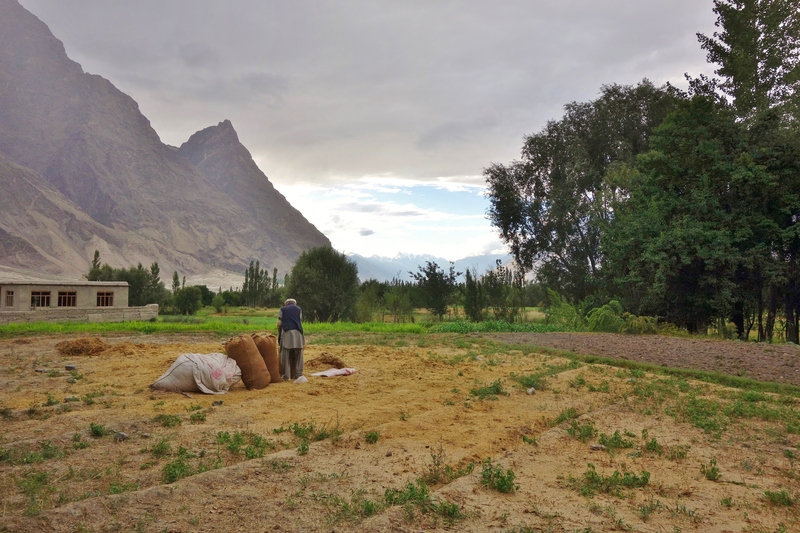 From Hispar we hire a tractor and descend a further 30km down the valley to Hopper where we transfer to a jeep and make the 4 hour drive back to Gilgit. That night we sleep in a warm bed but my thoughts are back in the tent playing cards and listening to Amin singing. 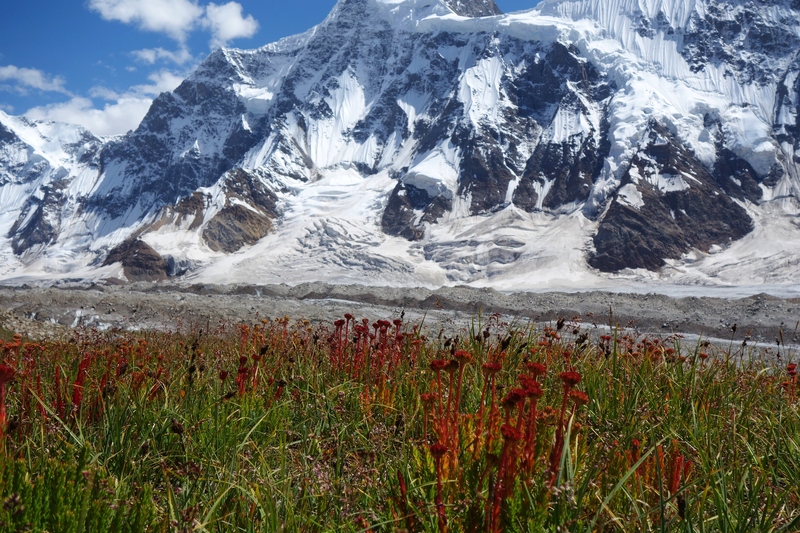 They can accompany you on short hikes or tours of northern Pakistan if trekking is not your go. 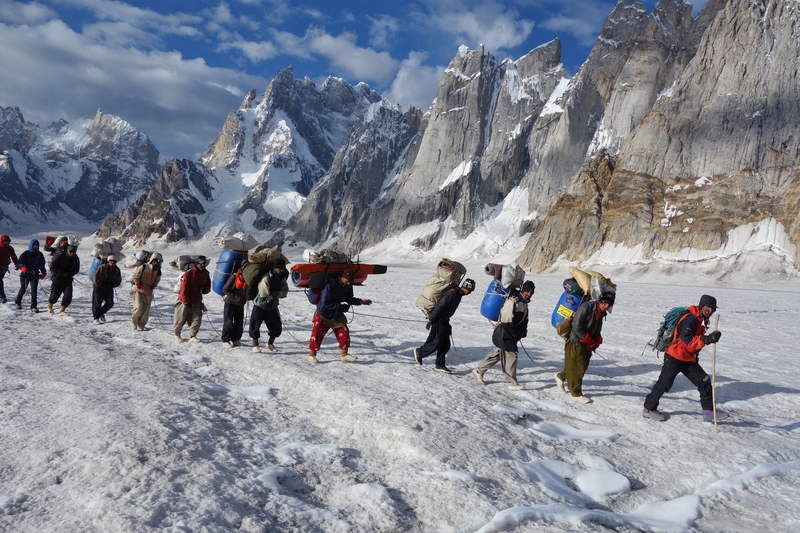 “Trekking Pakistan” for Nasir and “Habib Saqib” for Habib. We would be happy to answer any questions you have regarding travel in this wonderful country. 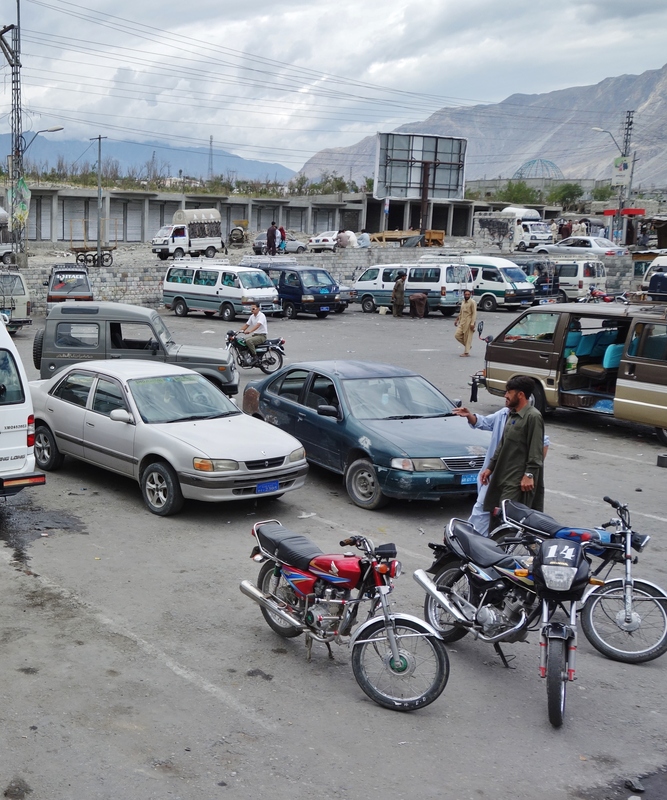 The bus depot in Gilgit is a bare earth compound. Its perimeter is marked by a low stone wall. Its exit is sealed by a rusty chain. The multitude of vehicles within are of various size but universal in their condition. The yard is dominated by men dressed in lose flowing trousers, matching long shirts (that extend to the knees) and flat woollen hats. It’s a busy scene. Summer holidays are coming to an end and people are returning to the southern cities of Islamabad, Lahore and Karachi after taking refuge from the heat, high in the mountains. 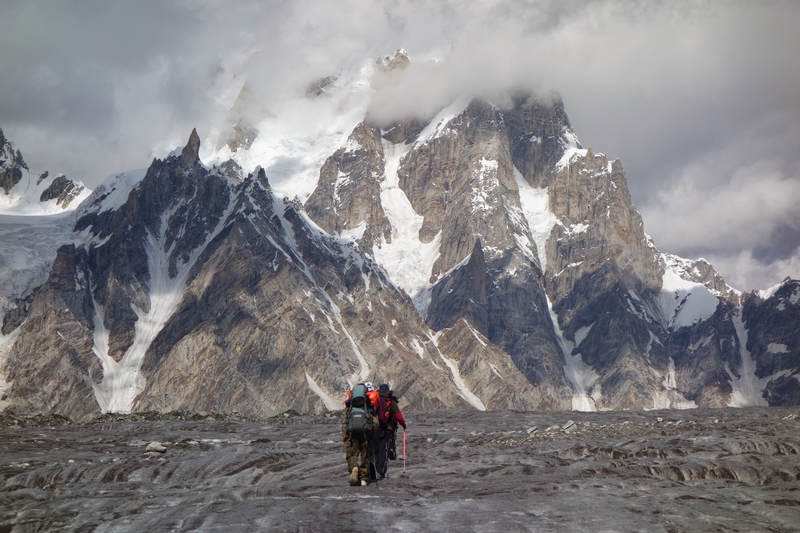 For the last seven days our physical journey across the earth has come to an abrupt and much needed halt, but today we are travelling to Skardu, a small city 150km east of Gilgit. While the distance is short, the journey is long. 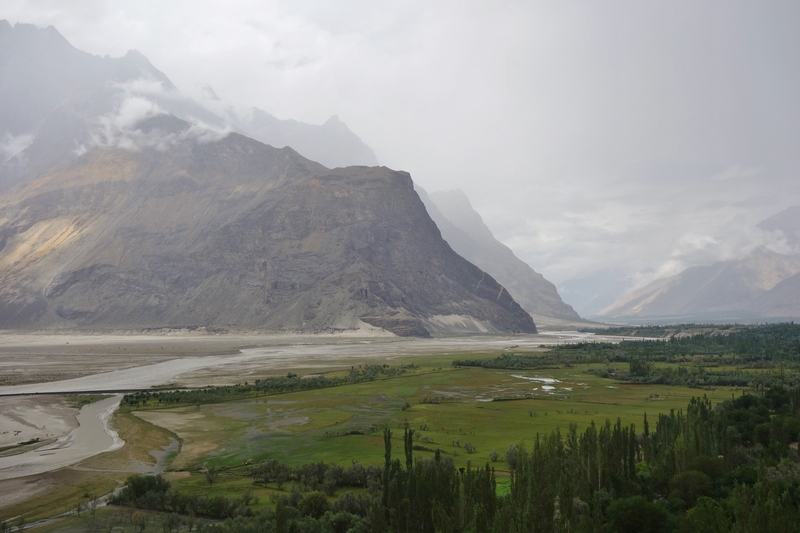 Skardu is connected to the KKH (Karakoram Highway) by a perilous dirt track that clings to cliffs above the Indus River. It is often, when raining, cut off by landslides and falling rocks. It has been raining. We are fortunate to have secured seats near the front. The road is forced to follow every bend and twist in the river. The van is forced to follow the road and your stomach is forced to follow the van. The driver is not governed by any force other than the will of God and rounds corners accordingly. Perhaps it is more his tight schedule and years of experience that have given him the confidence to do so. As we turn off the KKH, we cross a suspension bridge held up by a web of decaying steel strands. The wooden span ripples and sways like the waves in the river beneath us. The fatigued planks rattle under our bald tyres. Ahead lies the entrance to foreboding stone canyons and lofty peaks. The road narrows in expectation. 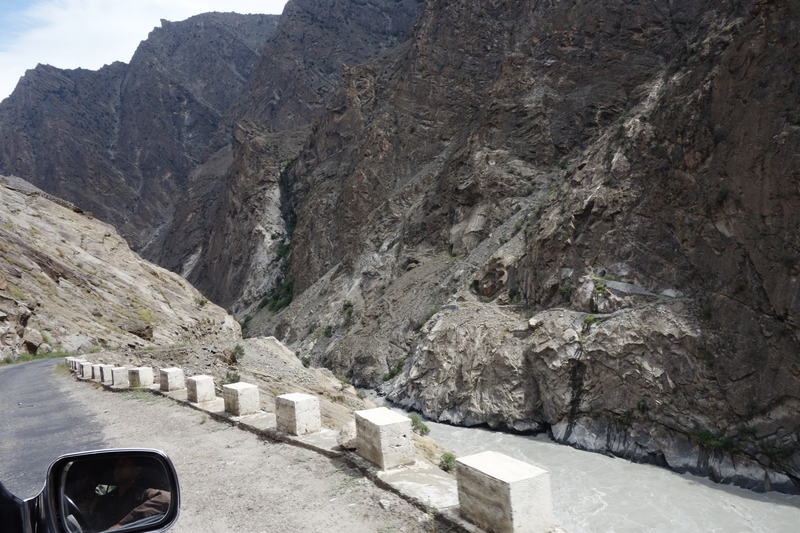 The Indus River is in full flow and fed by the summer melt of snow and ice. I watch its turbulent progress with fascination. A vast artery of brown muddy water eroding the banks and boulders that contain it. Like a tortured animal it fights back in protest. One huge rock in mid steam is being pounded relentlessly. I wonder how long this battle has lasted. We pass a decorated truck that is particular to this part of the world. Its flanks are painted with colourful birds, and scenes depicting green valleys. Below its bumper hangs a skirt of fine mesh chains. They swing and dance over every bump and play a metallic tune. The driver waves to me. The truck soon becomes a speck in a land of giants. Eventually after 6 hours the walls of the canyons retreat and soften. We emerge into a broad valley surrounded by snowy peaks. The river is wide and calm unaware of the battle that lies ahead. The sun has dipped below the clouds and now shines golden on the mountains to the east. The roads of Skardu are wet and muddy when we arrive. It’s getting dark and we still have another 35km to travel before we reach Shigar. Our driver (obliging like every Pakistani we meet) assists and calls for a taxi. It is too late to take a shared van. Within minutes a car arrives. The starting price is 2000 PKR or about $20.00 USD. We reduce this quickly to 1500 where the price stalls. Further polite appeals reduce the fee to 1400. I can see the driver is getting a little impatient and is reaching for the hand brake so the rate is fixed at 1400 PKR. 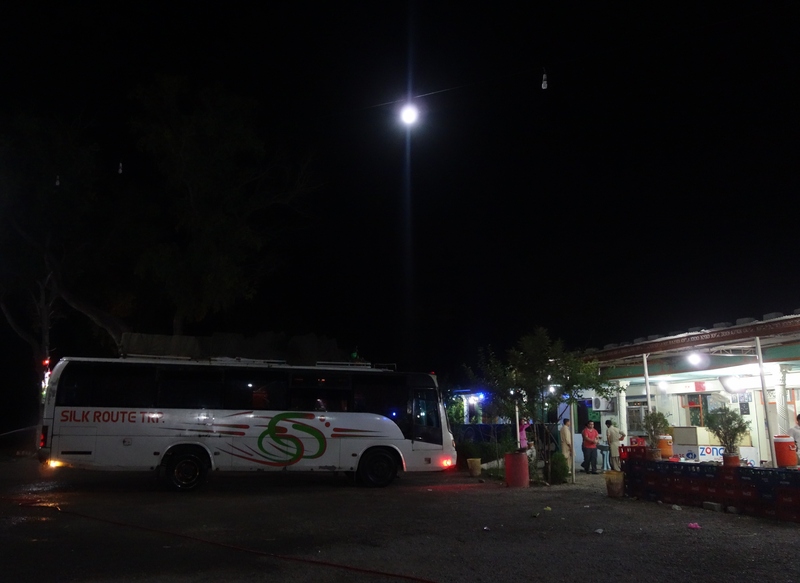 The moon is rising as we leave Skardu. My window is open and cool night air pours in. The mountains are now black silhouettes. There is just a trace of light in the west. The stars are shining and an Indian love song is playing on the radio. It is a special moment of beauty and independence. I want it to last forever. I feel so very fortunate. The moon and our dim headlights shine the way over a dark mountain road. We enter a village of dry stone walls and tall poplar trees. The houses are lit with candles and kerosene lamps. Among its sprawl sits a 400 year old fort. A beautifully restored construction of rock and wood converted into a hotel. Inside the corridors are supported by original beams blackened with tar and soot. It smells of old woollen rugs, lacquer and smoke. Our room has low ceilings and original features. 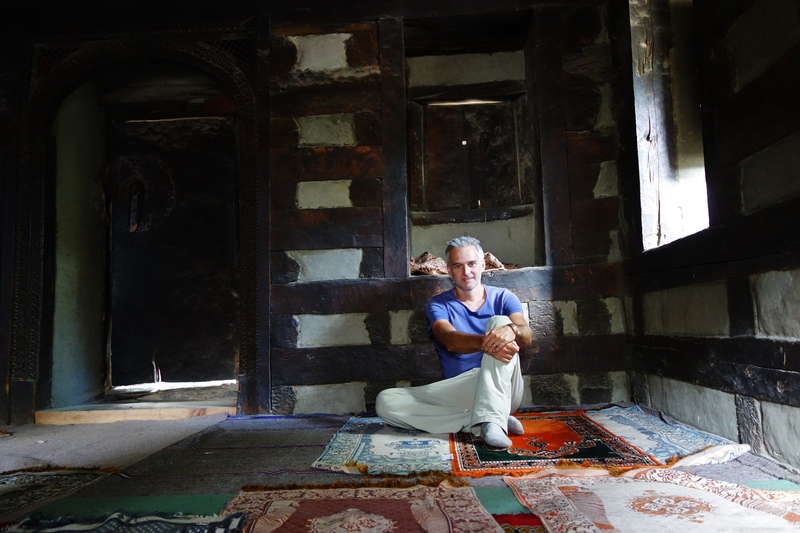 Traditional Balti carpets and cushions complete the decorations. I open the small windows and settle into bed. Outside the river plays all night long. The next morning reveals a splendour. The fort is surrounded by green gardens and high mountains. 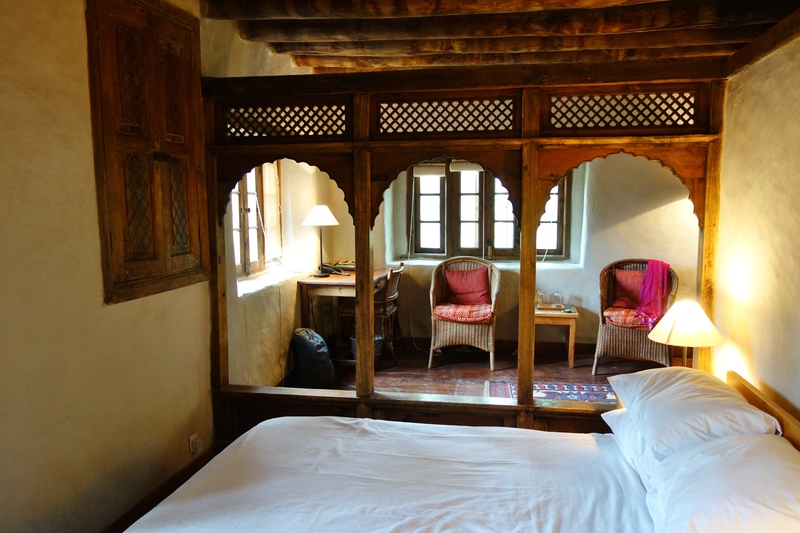 Our room looks onto an orchard filled with apples, plumbs, mulberries and apricots. Next to the fort and shading the garden is an ancient gnarled maple tree. We take breakfast under a pagoda covered with grapes. 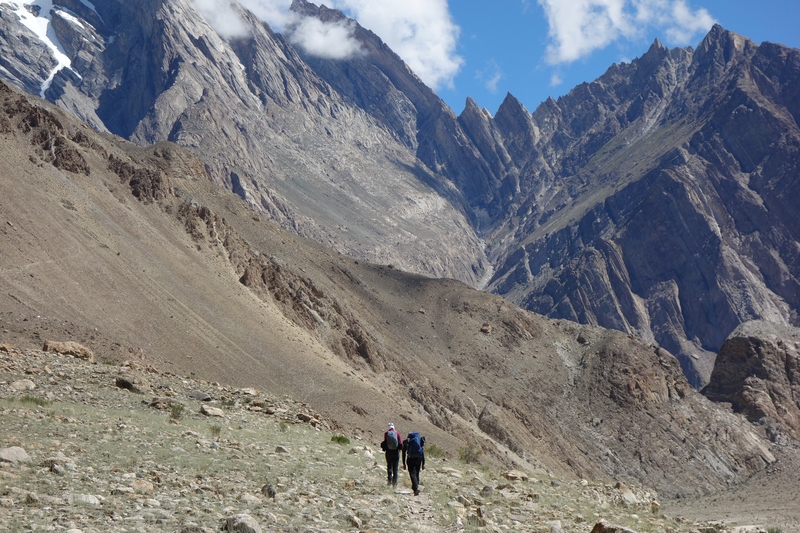 Despite the scenic distractions our minds turn to our upcoming trek into the mountains. 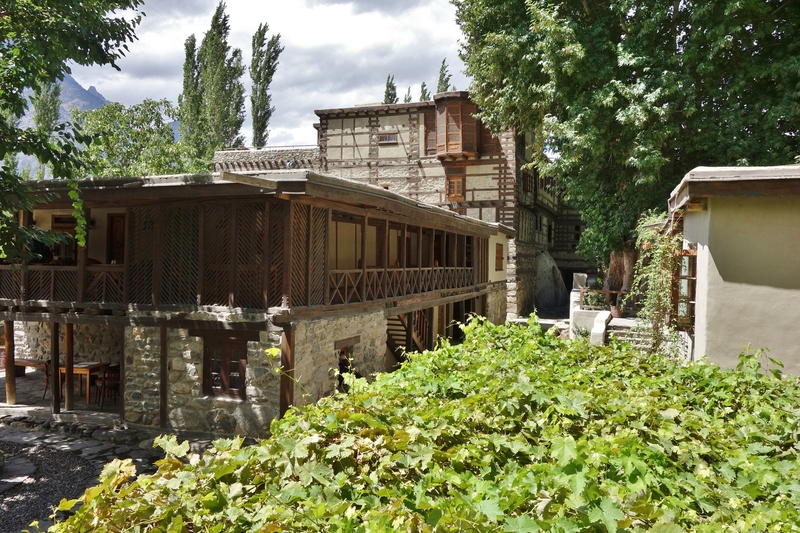 In the next few days we will drive further up the Shigar valley to the remote outpost of Askole. 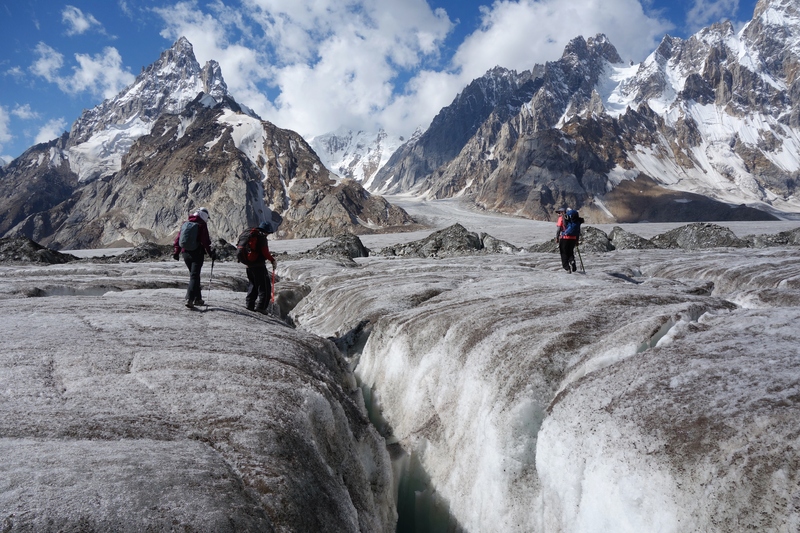 From here we will commence a trek across two of the longest glaciers in the world and a high pass for a total distance of just over 130km. Neither of us have been doing any exercise for months so the prospect is a little overwhelming. With this in mind we decide to take and extended exploration of the village and the surrounding farmlands. We are fortunate to meet Tahereh who originates from Karachi but has been living in the United States for many years. 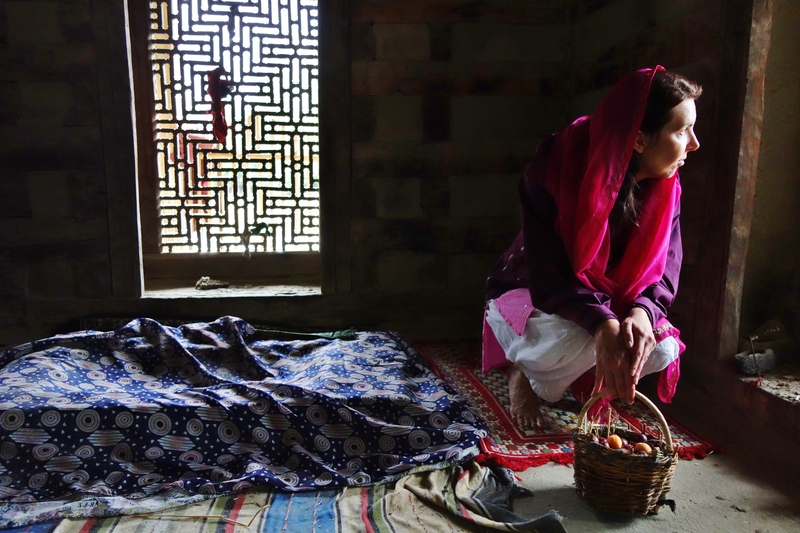 She too has fallen in love with the Shigar Valley and has been returning for many months each year working on a school project. The aim being to establish a Teaching Garden to stimulate learning. She takes us on a tour and introduces us to many of the local people and former students. The village is a maze of dirt roads and stone aqua-ducts used for irrigation. We pass over a bridge and into open fields. Men and women gather in the last of the summer crops. Wheat and corn are turning gold. Its hard work but necessary for the long winter that is coming. Children discover our intrusion and follow us from door to door. The boys are bold and the girls are shy but curious. We end up at the baker where Tahereh places an order for some buck wheat bread. Shigar has a collection of world heritage mosques, but these are not the domed and minaret versions we are so used to seeing. Before Islam came, this part of the world was Buddhist. The mosques here are wooden and closely resemble ancient stupas. Even the local Balti language is related to Tibetan. We pass a fine example faded and slightly tilted to one side. 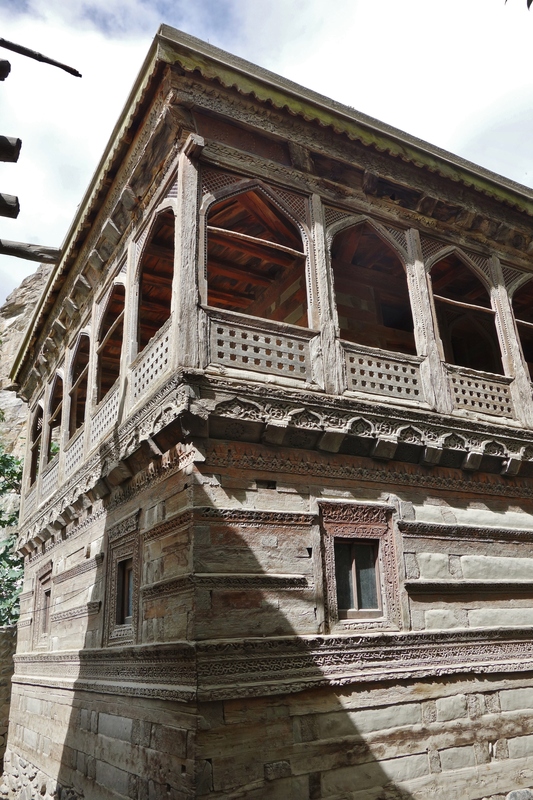 Its windows are decorated by overlapping layers of intricate carvings. Its roof is pointed like a pyramid and topped with a spire that pierces a crescent moon. 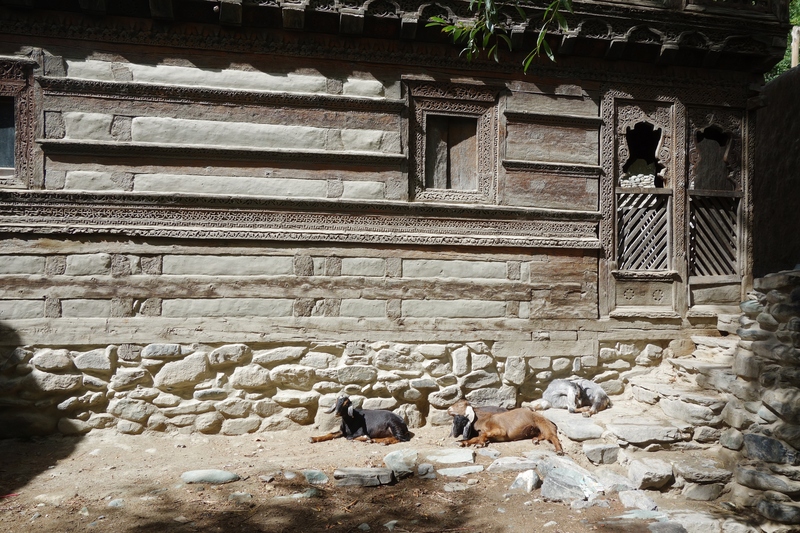 It is guarded by four goats who rest against a shaded wall. We walk around its perimeter in search of an entrance. I get the distinct impression we are being followed. One of the guards has risen and stands behind us. It bares its teeth and stamps its hoof. Of all the animals on earth none is more curious than the goat. The handle on the door is large and worn smooth by the generations that have turned it. The door creaks open like the lid on a vampire’s coffin. It is dark inside. The windows are small and perfectly crooked. 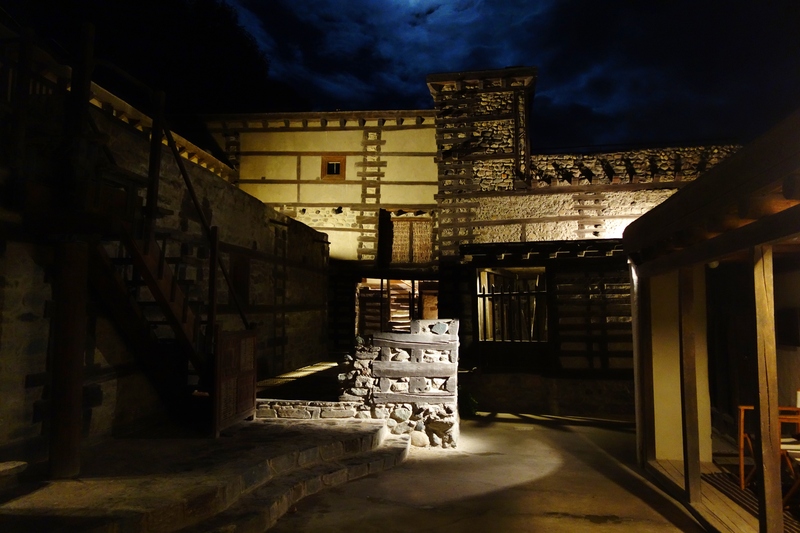 The walls are a patchwork of wood and plaster flecked with straw. Small alcoves contain tea pots and kerosene lamps. In the far corner are some matches and candles which we light. A centre poll is wrapped with different coloured cloths. The floor is covered with traditional prayer mats all facing the direction of Mecca. We close the door to prevent the guard from following us in. He bleats in protest. I sit and absorb the magic of this sanctuary. I stare out the window into a sapphire sky scattered with clouds. The leaves on a maple catch the sun. They are bright green and translucent in the light. Their shadows dance on the walls of the mosque. I lean forward, behind us a dark grey wave is consuming everything in its path. The bough on the maple starts to sway, the leaves rustle in anticipation and then roar as the wind strengthens. The mosque creaks a little but remains steadfast. I think about our journey and how it has taken us to this place, this moment in time. I wonder if our presence here is an intrusion but feel sure its builders intended it for such feelings of reflection. 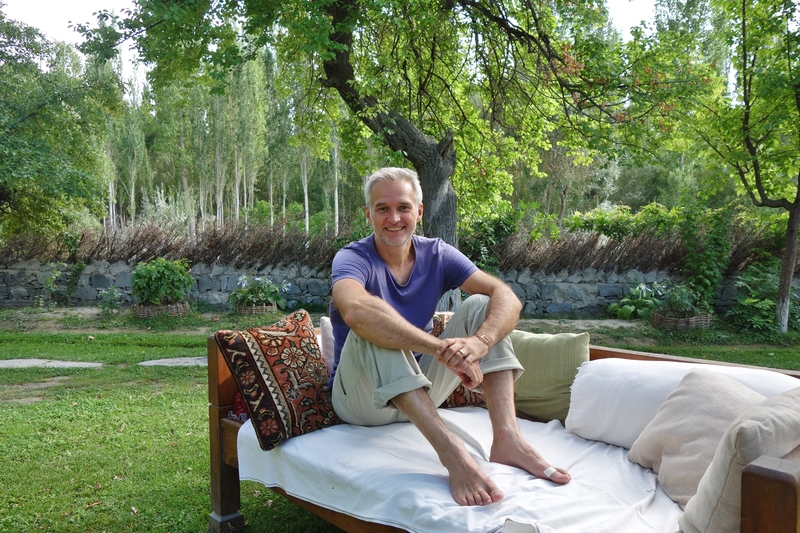 The next day we pay a visit to the Abruzzi school to see the progress that has been made with the garden. The students seem very surprised to see us. We are taken to a classroom of 5th graders and introduced. The current lessons are centred on North America and its indigenous history. We are asked to give a talk on North American Indians. The idea being that we will speak and the class will draw their impressions based on what we have said. 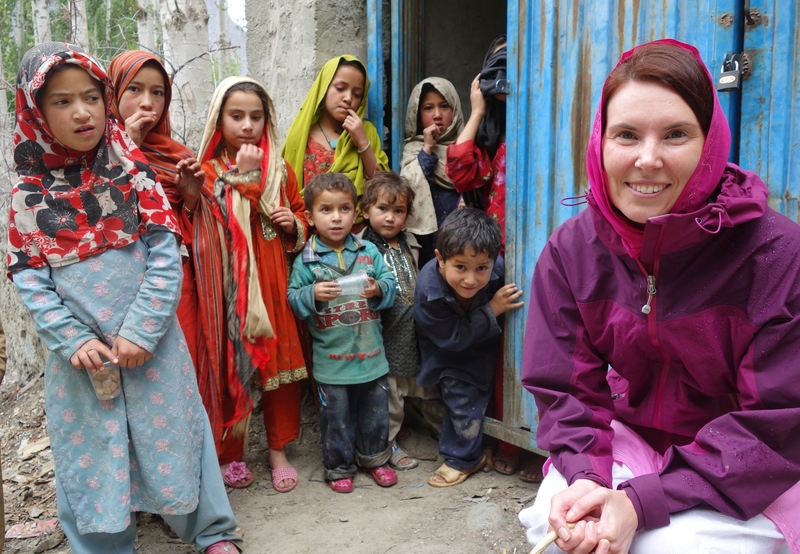 Feeling a little awkward and surprised we address the eager young minds of Shigar. Trying hard not to think about John Wayne movies we give a brief account and description of their lives. The clothes they wore, and the villages they lived in. One young lad draws a series of incredibly accurate pictures. We are both taken by surprise and wonder if it was more his imagination as opposed to our teaching that produced such wonderful drawings. We bid farewell to the students. It has been a wonderful hour and indeed a wonderful few days here in Shigar. It really is paradise on earth. We have been very fortunate to have seen and absorbed this community, but I am sure it’s real beauty will be remembered in years to come during pensive mood. 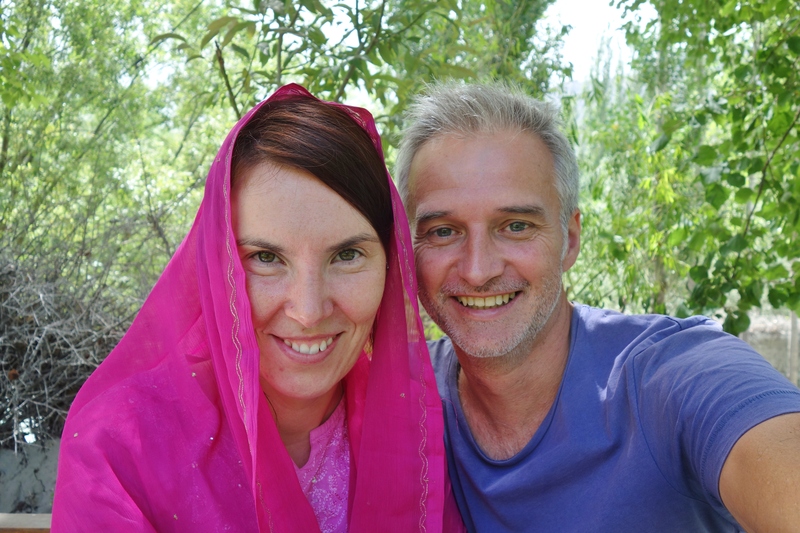 Tomorrow we leave for Askole and the start of our big trek up in the mountains. We are both nervous and excited.